Dr. William J. Broussard is a 10th-generation cattleman from Louisiana. He is descended from Joseph Beausoleil Broussard, the leader of the Acadian exiles who later became the Cajuns of Louisiana. Beausoleil was one of the Acadian leaders who helped begin the cattle industry in Louisiana. Dr. Broussard's branch of the Broussard family has been in the cattle business in Louisiana ever since. Dr. Broussard's father, Alphé A. Broussard, brought a herd of full-blooded Charolais cattle from Mexico to Louisiana which became the foundation herd of Charolais cattle in North America. Dr. Broussard grew up on the Flying J Ranch in Forked Island, Louisiana, and received his first cow as a gift at birth. 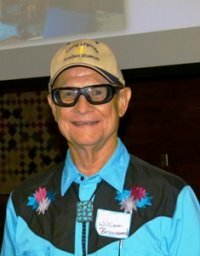 Growing up, he balanced a deep love of his ranching heritage with the dream of becoming a physician. In 1955, he graduated from Louisiana State University with majors in chemistry and biology. He was the fifth person to achieve a 4.0 average in the school’s history. He was the first graduate from LSU to be accepted into Harvard Medical School, but he opted to attend the University of Minnesota Medical School where he was the first graduate accepted from Louisiana. After becoming an ophthalmologist and completing his service in the army, Dr. Broussard moved his family to Florida and opened his medical practice. Today, Florida Eye Associates is one of the largest and most successful ophthalmology groups in Florida. He purchased 1,280 acres in Osceola County and established the Crescent J Ranch where he brought Charolais cattle from the Flying J Ranch foundation herd. His herd is renowned for its high-quality seed stock. Over the years, Dr. Broussard became known for his many contributions as a rancher, ophthalmologist and conservationist. In the late 1980s, Broussard became interested in preserving “Cracker Cattle” which were descendants of the cattle brought to Florida by the early Spanish explorers. These Cracker herds are descended from the same early Spanish herds that became the root stock for the large herds that the Ishak (Attakapa) Native Americans sold and traded to the early Acadians settlers in South Louisiana. In 1990, Dr. Broussard purchased 12 cows and one bull (“Bulldozer”) from the State of Florida. They were certified to be pure descendants of the Spanish cattle and registered as "Cracker Cattle" by the American Livestock Breeds Conservancy. Other registered cracker cattle have been added to broaden the genetic base of the Crescent J herd, now numbering in the hundreds, and is the largest herd of registered Cracker Cattle in the world. Dr. Broussard also began preservation efforts on cracker horses, and today he also has the largest herd of registered Spanish Colonial (“Cracker”) horses in the world. When the Broussards lost their son Allen, a gifted wildlife biologist who was committed to conservation, William and his wife Margaret established The Allen Broussard Conservancy (ABC), a 501(c)3non-profit corporation that acquires and manages natural lands for conservation. Today, the ABC oversees 4,700 acres of pristine land known as Forever Florida. There visitors can enjoy unspoiled Florida as the early Spanish explorers found it, or experience an eco-adventure from a zip line, horseback or coach tour.